Chido and Padre’s entrance welcomes guests with a brightly lit decor and drapes of bright magenta, delicate turquoise and sunset orange. Latin music streams from inside to match the colorful interior. Chido and Padre’s replaced Smokebelly BBQ in Buckhead in March. The lively restaurant focuses on Baja Mexican cuisine and fresh ingredients, especially for seafood and produce. Chido and Padres’ colorful flair and emphasis on tradition allows the restaurant to continue Smokebelly’s legacy of smoking all of its meats, from grilled chicken to shredded beef. My friend and I arrived at the festive restaurant and bar at noon on a Saturday. Immediately, a friendly hostess asked us where we would like to sit. We were seated between the outside patio, which was aglow with string lights, and the artfully lit interior, which displayed geometric designs on the chairs and walls. From the moment we stepped in, we could see that each piece of furniture and fixture had been carefully selected and arranged to give off a lively, coastal vibe, from the intricately woven chairs to the bright, tiled tables. As we pored over the menu, our waiter brought over a basket of complimentary housemade chips and salsa. The chips were crunchy and warm, lightly buttered over and cooked slowly, according to our waiter. A perfect condiment, the salsa was made from green onions, cilantro and tomato paste, and had just the right hint of sweetness. At one page each, the menus for lunch, dinner and drinks were simple. I ordered the smoked beef brisket tacos, and my friend ordered the tres quesos quesadilla. Each dish came with a side of arroz verde (green rice infused with cilantro and chile) and frijoles negros (black beans). As I bit into my soft tacos, which were loaded with fried onion sticks, I savored the juicy and tender shredded beef with each mouthful. The tacos were streaked with avocado sauce that added an extra layer of creaminess. The beans were soft and flavorful, either drizzled over the tacos or eaten on the side with the rice. My friend enjoyed her quesadilla just as much. As the name implies, the tres quesos quesadilla is a rich mix of three different cheeses: Oaxaca, Monterey Jack and Cotija. Wrapped in soft flour tortillas, the warm and thick quesadilla melted slowly in our mouths (I tried a few bites). A cheese sauce drizzled on top of the quesadilla topped the dish off with a creamy finish. 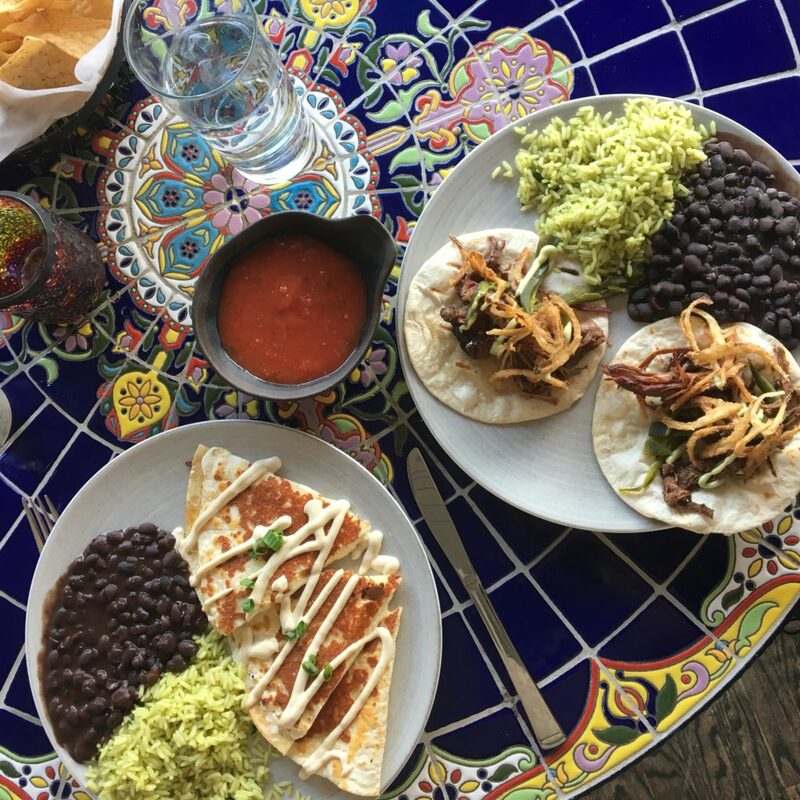 Although my friend ordered the quesadilla bare, the menu offers add-ons, including grilled mushrooms, chicken and beef brisket. Chido and Padre’s’ tender, home-cooked Baja meals provide diners with a truly distinct cultural and culinary experience. In Mexican culture, family is a core value. Chido and Padre’s embodied the “mi casa es su casa” sentiment as each member of the restaurant’s staff greeted and accommodated us with genuine kindness. They made sure we felt welcome from conversing with us to constantly bringing us water and chips. The food, in its simple and delicate goodness, deserves five stars. But beyond the dishes alone, the traditional Mexican interior design and caring staff make for a five-star ambience that is just as alluring as the food. My friend and I will definitely be back for more.